Lastôvka. An almanac compiled and published by Yevhen Hrebinka in Saint Petersburg in 1841. 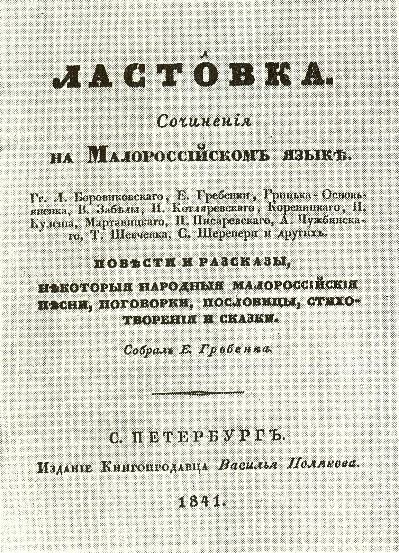 It had 382 pages and contained works by Levko Borovykovsky, Hrebinka, Hryhorii Kvitka-Osnovianenko, Viktor Zabila, Ivan Kotliarevsky, Porfyrii Korenytsky, Panteleimon Kulish, P. Pysarevsky, Oleksander Afanasiev-Chuzhbynsky, and Taras Shevchenko. It also included folk songs, popular proverbs, and folktales.